A myeloma list member asked me if I would publish the following question: has anyone with low hemoglobin ever been on a long flight? If so, he would appreciate receiving details, advice etc. (If you don’t want to leave a public comment, please use my Contact form…I will forward any messages to him). His wife, whose hemoglobin is 7.5 g/dL, is planning a trip from Japan to Los Angeles, U.S.A. The airline, however, informed her that she cannot take any supplemental oxygen on board unless she applies for permission three months in advance. I found a couple of items on this topic just now: Patients with anemia must undergo medical assessment before embarking on a flight. Anyone with a hemoglobin level below 8.5 g per dL (85 g per L), as in sickle cell anemia, should have an oxygen supplement (see http://tinyurl.com/y962hax and also http://tinyurl.com/ybgnetf). I am not sure what I would do if I were in her shoes…but, after reading the above-mentioned links, flying without supplemental oxygen sounds a bit risky to me…even though the second link states only that it is “generally advised” to have some extra oxygen on hand…Any further thoughts? Thanks! I thought it was a great suggestion. So I began writing this post. But nothing came to me. No words. No comments. No bits of advice. Very few thoughts at all, in fact. Why? What’s wrong? Here are some actual maintenance complaints/problems, generally known as squawks, recently submitted by Qantas pilots to maintenance engineers. After attending to the squawks, maintenance crews are required to log the details of the action taken to solve the pilots’ squawks. Problem: Left inside main tyre almost needs replacement. Solution: Almost replaced left inside main tyre. Problem: Test flight OK, except autoland very rough. Solution: Autoland not installed on this aircraft. Problem: Something loose in cockpit. Solution: Something tightened in cockpit. Problem: Dead bugs on windshield. Solution: Live bugs on backorder. Problem: Number 3 engine missing. Solution: Engine found on right wing after brief search. Problem: Autopilot in altitude-hold mode produces a 200-fpm descent. Solution: Cannot reproduce problem on ground. Problem: Evidence of leak on right main landing gear. Solution: Evidence removed. Problem: DME volume unbelievably loud. Solution: Volume set to more believable level. Problem: Noise coming from #2 engine. Sounds like man with little hammer. Solution: Took little hammer away from man in #2 engine. Problem: Whining noise coming from #2 engine compartment. Solution: Returned little hammer to man in #2 engine. Problem: Friction locks cause throttle levers to stick. Solution: That’s what they are there for! Problem: IFF inoperative. Solution: IFF always inoperative in OFF mode. Problem: Suspected crack in windscreen. Solution: Suspect you’re right. Problem: Unfamiliar noise coming from #2 engine. Solution: Engine run for four hours. Noise now familiar. Problem: Mouse in cockpit. Solution: Cat installed. Science Daily provides a good, easy-to-read summary of the study: http://tinyurl.com/ylcfqbc Interesting excerpt: this paper, published online in the journal Breast Cancer Research and Treatment, is the first to suggest these dietary compounds could prevent cancer by targeting stem cells. The first of many, I hope! Wait a sec…in June we were told that EGCG antagonizes bortezomib (see: http://tinyurl.com/yfe24cl, full text also available for free)…this group of researchers found that not only was EGCG not toxic or (at higher concentrations) only mildly toxic to myeloma cells, but also it prevented bortezomib from doing its job. In other words, based on the June study, EGCG actually protected the myeloma cells…from bortezomib. Okay, for reasons of simplicity, from now Study A will be the June anti-EGCG with bortezomib study, and Study B will be the November pro-EGCG with bortezomib study. -They use a relative [sic] lower concentrations of EGCG (10 mM) and bortezomib (10 nM), whereas we used a relative [sic] high concentration of EGCG (25, 50, and 100 mM) and bortezomib (20 nM). So let’s see…Study A used a lower dose of EGCG and bortezomib, Study B a higher one. Okay, that is certainly a difference. -We focused on the mechanism of EGCG inhibiting myeloma cell growth and inducing cell apoptosis potentiated by bortezomib, whereas they focused on the effect of EGCG on bortezomib in myeloma cells. So, we found that EGCG inhibits myeloma cell growth and induces cell apoptosis potentiated by bortezomib. This part wasn’t clearly worded, in my opinion (but it is true that I just got over a cold…is my mind still fogged by a bit of congestion?). In fact, I don’t see any difference at all…Mental note: I need to find the time to compare how the experiments were carried out in both studies. -This may be because of different drug concentrations or different cell lines. Study A and B (and even the above-mentioned 2006 study, by the way) tested EGCG and bortezomib on different myeloma cell lines. And different doses were used in both studies. Is that enough to explain their differing results? Possibly. And now we get to the point of this post: yesterday, while nervously waiting to go pick up Pinga at the vet’s, I decided to put my blog on Facebook. On a whim. I don’t yet have a purpose in mind, except the obvious one, I suppose, of reaching out to others (even though, truth be told, I can barely keep up with my blog mail as it is!). I also thought that Facebook might offer a more direct and informal way to connect with other blog readers…so, if you are a member of Facebook, why don’t you become a fan of Margaret’s Corner, too? The Myeloma Beacon just published an article on curcumin, see: http://tinyurl.com/yebc4qh. I was “interviewed” (via e-mail exchanges, since I live in Italy) by Francie Diep, who did an excellent job. I would only like to add that we will (almost certainly) never see wide-scale clinical trials testing curcumin, since, as I have written in past posts, drug companies have no interest in a substance that cannot be patented. P.S. Pinga was spayed this morning. My vet just called to let me know that she is fine (relief!!!). I am picking her up this afternoon…can’t wait! P.P.S.S. 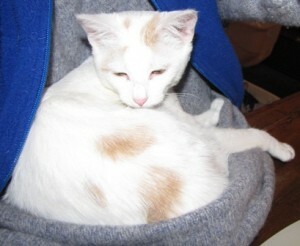 Mental note: never take a test of any sort on the same day a beloved kitty is getting spayed…! I haven’t written anything in the past few days because I have come down with a bit of a cold (not surprising, all things considered!) and, on Saturday and Sunday, I even had a slight temperature. Today my temp is back to normal (update: slight fever again this evening, oh drat, chebarbachenoia! ), but I am still somewhat stuffed up, and, truth be told, my mind is a bit on the foggy side. On Friday night, when I began having the first cold symptoms, my first thought was “uh oh!” Because of my teeny tiny immune system, even the slightest cold quickly develops into bronchitis, which means that I have to go on antibiotics for at least ten days (=this hasn’t happened in a long time…in fact, I can’t even remember the last time I had a cycle of antibiotics…). This time, though, my cold, at least thus far!, has remained in my head…no sign of a cough (fingers crossed, knock on wood, tocca ferro!). I am using a Neti pot (see: http://tinyurl.com/5ks3p2) twice a day. Now that is a great invention. To be honest, I was skeptical that it would work…but, on a whim, last summer I bought two Neti pots. You won’t know if you don’t try, right? Stefano tried his first and noticed a big difference in his breathing (is he going to be terribly annoyed at me for mentioning publicly that he suffers from nasal polyps? Oh well …!). The Neti pot has really helped him clear out his sinuses and stay off cortisone…as long as he doesn’t get a cold, that is. I first tried my Neti pot in November or December, I forget exactly, when I felt a cold coming on. Wow. Amazing. I staved off the cold entirely. And, incidentally, the sinus cleansing process is not as gross as I thought it would be…! I am also taking two teaspoons four times a day of Sambucol, the black elderberry extract that I have written about in a post or two. Good stuff! And I am taking a couple of teaspoons of Manuka honey every day. Can’t hurt, could help. As a result, I have nicknamed her “Polter(geist).” My tiny adorable cuddly amber-eyed Pinga, Pinga the Terrible Polter, who, by the way, is taking a cat nap between the keyboard and yours truly as I type this post. Luckily, she seems to be slowly coming out of “heat,” so, if all goes well, she will be spayed on Wednesday or Thursday. We have to act quickly, because cats go into heat again within a few days…and I seriously doubt we could survive another week of the alien shrieking…yikes!